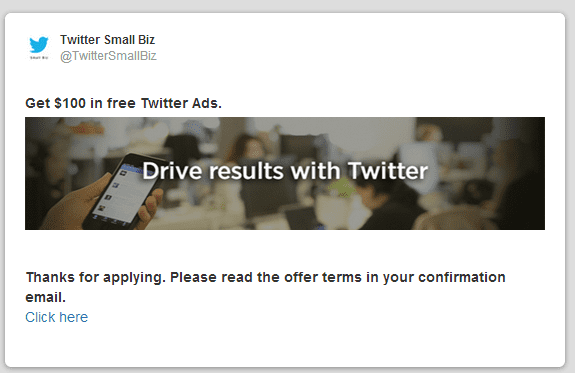 Twitter Ads have a secret feature – Do you know about it? You’re probably aware that Twitter is often overlooked, especially in comparison to Facebook’s advertising capabilities. But here’s something you might not know: You can promote someone else’s tweet. All of your positive mentions and implied endorsements from others on Twitter can be retargeted to relevant audiences on Twitter. Think about the opportunities this allows- the ability to amplify what others are saying about you, putting positive endorsements in front of whoever you’d like. Definite jet fuel for your personal brand. Here’s how to take advantage of this little known feature. 1: Get permission from the tweet’s author. Before heading over to Twitter, figure out whose tweets you want to promote and get permission from them. This is the main reason this technique is not as widespread as it could be. To promote someone else’s tweet, you need their written permission to show to your account manager at Twitter. If you don’t already have an account manager, you’ll need to start advertising on Twitter until you reach their spend requirements. 2. Define your promotion objectives. 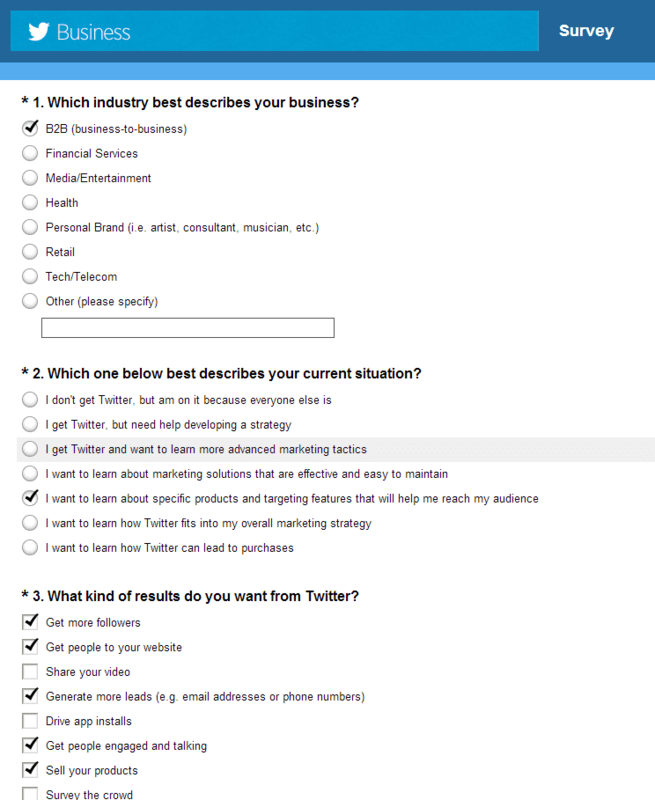 To promote a tweet, head on over to your Twitter Ads account, found in the upper-right drop-down menu. Click on “Create new campaign” and then “Tweet engagements” for the objective. Give the new campaign a name and set some start and end dates (or run it continuously if you have an evergreen piece that you want consistently promoted to new people). Here’s where you can really refine targeting. Start with the location (in this case, United States). Next, if you want to target a specific gender, language, device, platform, or carrier, you can do so here. You’ll want to continue to narrow down your target. Scroll down to the “Additional Audience Features” and take a look at the options here. For this example, I want to target the followers of some specific profiles, so I’ll choose the “Add followers” option. If you want to target multiple usernames, like I do, click the “Import multiple @usernames” button. Throw in however many username’s followers you want to target and click “Verify @usernames” to make sure you typed them in correctly. If everything looks good, go ahead and click “Add users”. Let’s set up a budget now. This example is utilizing the “Dollar a Day” method here to reach a targeted, relevant audience inexpensively. Set a higher daily budget if you have something you want more people to see, or if you notice that your campaign is doing well in one of your check-ins. Now select the tweet you want to promote. If you gained permission properly at the beginning, you should see the Twitter handle here in the dropdown menu. 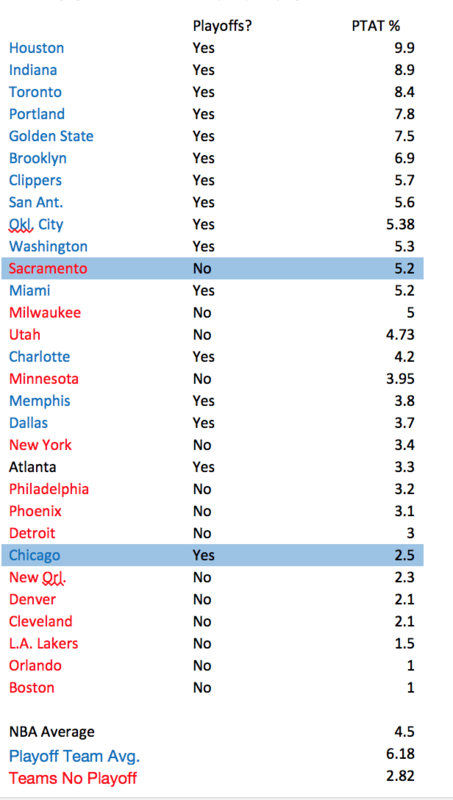 Click on it, and you’ll see a list of all their tweets in the field below. Once you’re happy with everything, scroll back up to the top and click the blue “Launch” button. You’ve successfully promoted someone else’s tweet. This technique grants you a great deal of power and access, so use it wisely and respectfully. With permission, you’re able to promote and compose tweets on behalf of any handle. Because of this, you must have a solid relationship with these users before you are able to use this feature. Don’t just ask for or give permission yourself without first understanding this. Since I used our “Dollar a Day” method here, The campaign gained almost 4,000 relevant impressions with a 2.21% engagement rate. That comes out to just over a $0.30 CPE and a total cost of about $25. The key point to remember is that all of those impressions were relevant ones. They saw the ad because they followed the accounts that I targeted, which means they care about the same things I do. 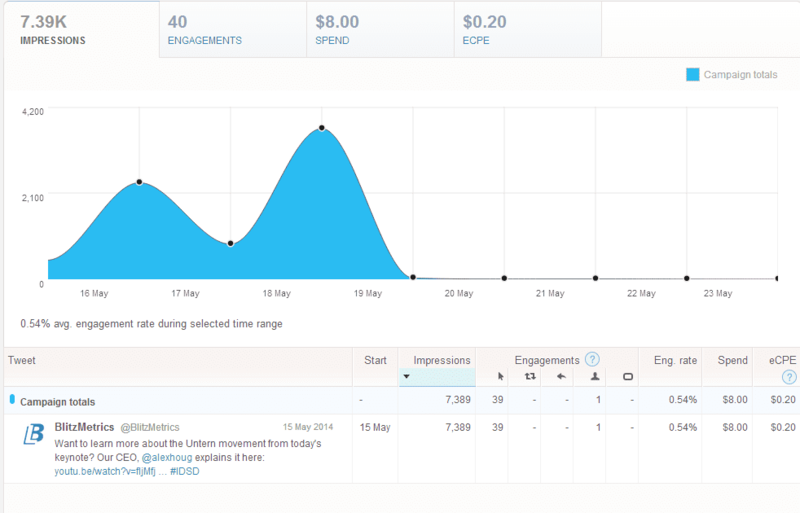 Targeting relevant users provides cheap, meaningful impressions and engagements. It changes a user’s opinion from an “annoying ad” to something they’re happy to see. Music festivals, much like professional conferences, have two categories of attendees: performers and audience members. The performers will naturally begin to promote your festival for you on their social media channels because they want their fanbase to attend and support them. The more fans they bring to the festival, the better they look, and the more new fans they’ll attract. Because you’re in a position of authority, most bands won’t have any issues granting you access to promote their tweets. It’s free promotion for them, and everyone benefits. You can take a tweet from one of the bands and promote it to people that are similar to their followers, people interested in music festivals, people that tweeted specific keywords (band names, lyrics, etc. 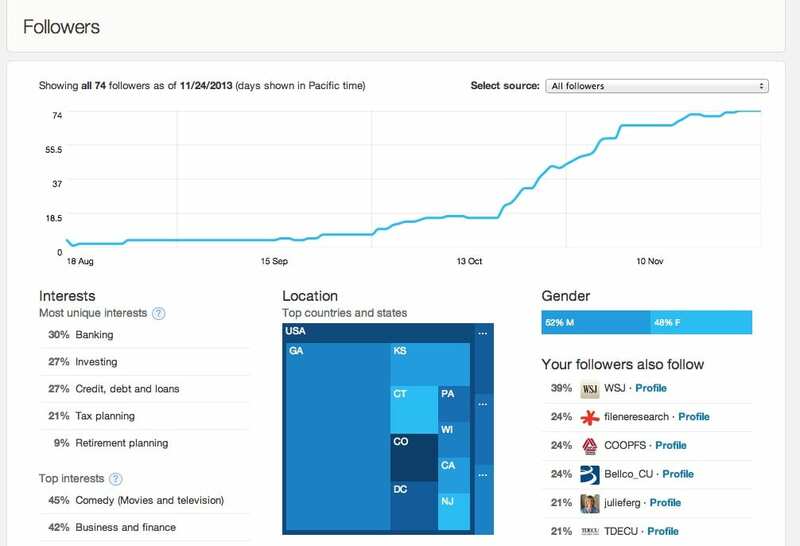 ), or any of the various targeting features Twitter offers. Apply this technique across the lineup of bands and you will increase your reach to relevant audiences exponentially. Replace “band” in the above example with “presenter” and you’ll see how this applies if you’re a conference organizer wanting to boost your attendance. Have you used this feature before? What have you used it for? 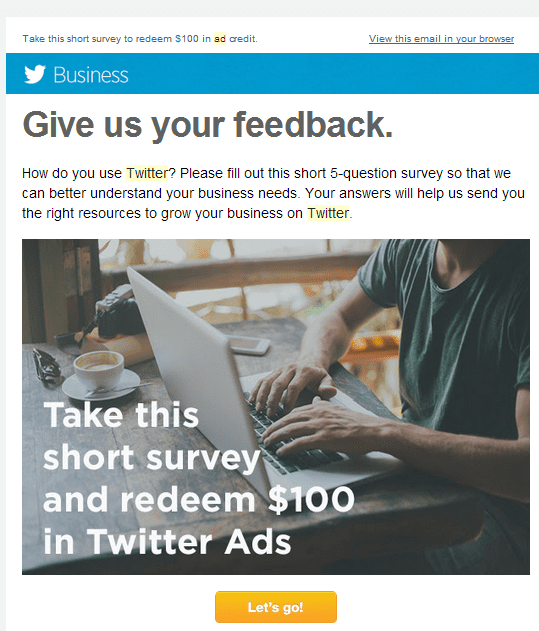 Get 100 dollars Twitter ad credit from answering 5 questions. Facebook has always been our choice for advertising with it’s robust platform. However, Twitter has recently started ramping up their efforts to attract advertisers. Where as Facebook reduced the amount of ad types by combining them together, Twitter announced last month that they’re working on 15 different ad types. Answer all of the questions. We like to participate in these to improve the platform- they’ll never know what to tailor it to if you don’t give feedback! Now you’re ready to start running ads! 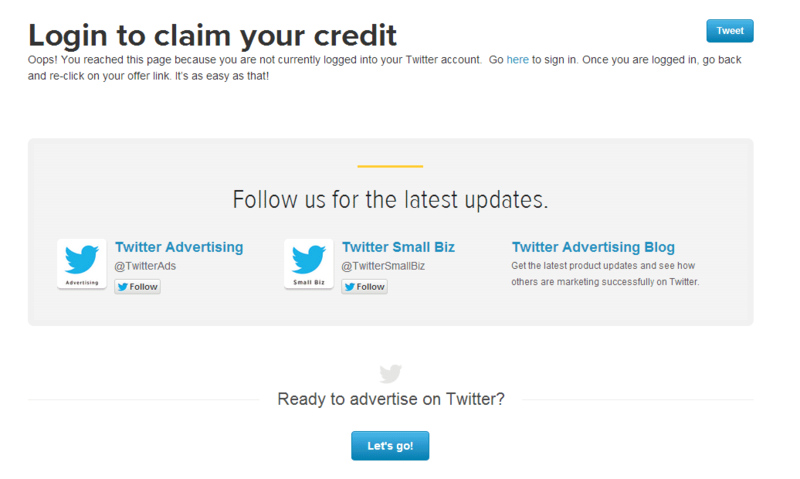 If you’re setting up Twitter ads for the first time, you’ll have to enter a credit card in order to get the credit, however. 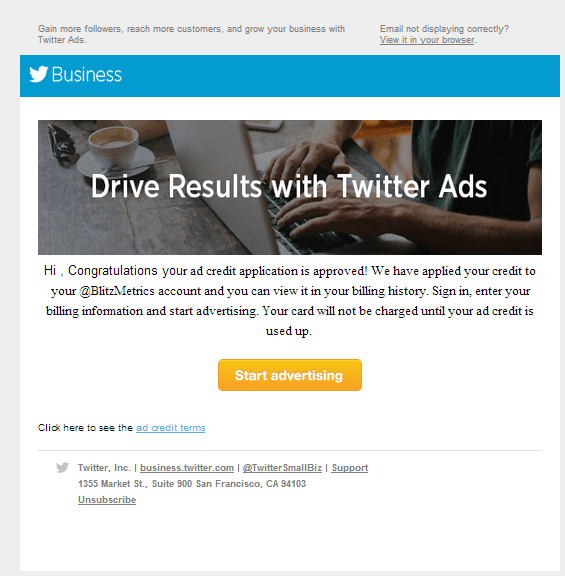 Enjoy your $100 worth of Twitter ad credit. Our initial bid was $0.25, working out to a $10 CPM- which is quite high, and in turn, drives up the cost per engagement to 20 cents. The default bids are always super-high, so be careful when making your campaign. In this case, we should be bidding about 15 cents, unless we can’t get traffic in the auction at that price. If this happens to you, either your bid is too high or your budget is too big– one of the two is usually out of balance (and it’s likely the former). Give this a try and let us know your campaign results! We’re always happy to feature awesome stories. I can understand banning get rich quick schemes and loan sharks, but the local credit union? 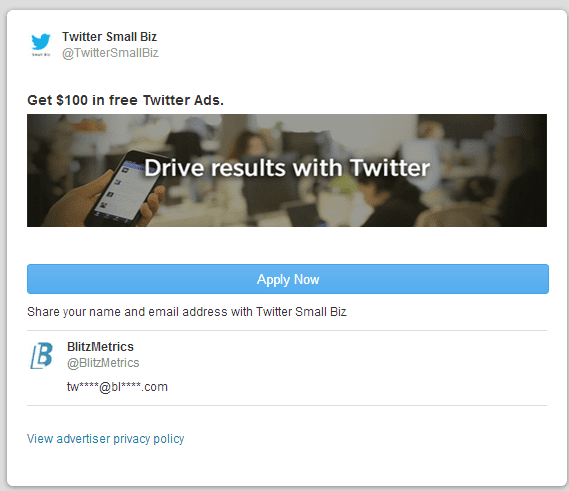 Notice that Twitter is banning the small business financial institutions, so the major banks can still advertise. I am a Social Media Marketing Consultant and my company, Social Stairway, specializes in building engagement and measuring success for small to mid-sized businesses via social media. Currently we are working with a medium sized Credit Union in the Southeast with 38,000+ members. Our launch for them on social media has been a tremendous success so far this fall, but we have run into a road block with not being able to promote our account or tweets on Twitter. We REALLY want to advertise more there. Our mission via Social Media is to reach out to members and the community and provide sound financial advice as well as help with questions regarding our services and personal budgeting and retirement planning. Our Facebook community has grown to over 1,000 fans is less than two months, so clearly we are doing something right and we believe that it is essential for Credit Unions to be represented on Twitter. Without the ability to promote our tweets and account with the ads it makes it very difficult for us to reach our target audience. We have submitted 4 enquiries with Twitter regarding when our account will be reinstated and have received the same exact email (see above) 4 times with no explanation or idea as to WHEN we will be able to advertise again? 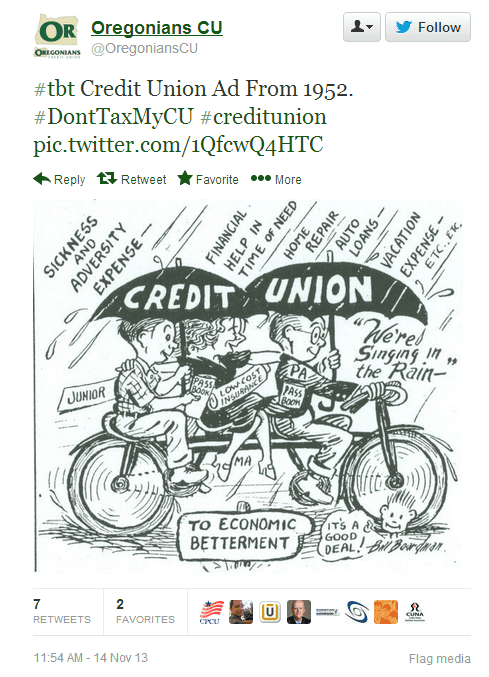 Who would you rather see in your stream– a major credit card company or your local credit union? Readers, what do you think? Twitter folks– you’re welcome to chime in or write a guest post in response.